Very easy to install, simply plug n' play! Home networking has never been so convenient. This is actually an interesting little product. The Actiontec HLE200AV0-01GK MegaPlug 200 Mbps Powerline HomePlug A/V Gaming Adapter Kit (mouthful, isn't it?) works as advertised. You plug one end into the wall near your router, and the other near the target PC or console (if the case may be), connect cables and voila, instant network connection. The only software that comes with the MegaPlug 200 is an application to change the "encryption settings," which is probably something you'll never need to do. It works out of the box, and it works well. There are a couple of cons to report: 1. You cannot have it plugged into a power strip or backup unit, it either has to be directly in a wall or into a straight extension cord. 2. Actual speeds don't quite live up to the "200 Mbps" hype, although they are significantly better than any wireless solution (including n). When I noticed this product in my Amazon Vine Newsletter, my initial thought was "we don't know what it's for, but we wants it!" I zeroed in on "gaming," because my family is into that. Now that I have it, I'm pleasantly surprised. This product will help boost the speed of your EXISTING home network, by using the outlets in your home (the speed of electricity). Plug one adapter in near your modem and connect to it with an Ethernet cable, and your second adapter can be plugged into any other outlet in your house. The second outlet can connect to any PC or Gaming console that has an Ethernet port. This will work with your wireless network, but does not work wirelessly. However it does cut down the necessity of a wireless network since you don't have to run wires around your house if you use this. My primary use for this kit will be console gaming since my connectivity is usually VERY slow. This is ideal for people with an Xbox 360 who, like me, had trouble with the wireless capability (or lack thereof). I have NEVER been able to get the wireless adapter for my Xbox 360 to work. We tried both the Microsoft official adapter and a generic one - neither worked. In desperation, I finally moved my modem upstairs so that I could plug the 360 directly into it and get to Xbox live. Now I can move the modem back. I also have a Wii that I would eventually like to try this with. However, the Wii does not have an Ethernet port, only USB. So customers would have to buy an adapter (which this product does not have, but should for the price). Though this product is great for console gaming, it is also ideal for setting up "LAN parties." My family runs secure wireless networks in their homes which can make it a pain trying to get a friend, or even family member on. This helps negate that issue. If you're reading this review and wondering what exactly this product does, you're not alone. After reading every detail on the package, it was barely clear to me as to what the product even was. All of the information is just a series of vague compliments about itself like "easy to set up!" and "works at high speeds! ", or my favorite, "integrated quality of service". What does that even mean? It means they knew there wasn't much to say about their product so they resorted to useless information. The way this works is you connect one plug into the electrical outlet and a modem/router, and the other plugs into a different electrical outlet and the device that is connecting to the internet (computer, game console). For this price tag, why not buy an actual router that connects to more than one device without clogging outlets with these giant boxes? A router is half as expensive and exponentially more versatile. They work as intended, and through a surge supression unit (at least for me anyways). If you don't want to run data, then these are actually -- quite effective. In fact, the only reason I rated them 3 stars is because of the price. Let's be honest, it you dont want to run data, you can setup a new wireless N device at home for the same amount of money, if not less. With the wireless technology, you're not limited to s single device either. However, having said that, for the average person who just wants to plug on their XBox or has a single computer that is not near their high-speed modem, this this is a viable solution. Simply plug them in and violla, you're networked! It also comes with a CD to setup encryption, for those of you that a paranoid enough to take the time to read about it, but I did not use the encryption. Pros: Easy setup, networking simplified and offers security. Great product that does what it is supposed to do!!! Having been dealing with a weak wireless connection throughout our home, especially when we stream HD movies through our 360 and while gaming.... I jumped when I saw that this product was available. I handed the box to my hubby LOL and he slowly began connecting everything. First he plugged one near our router which is located in a closet and the other one by our XBOX 360. A minute later the eternet cables were connected and VIOLA!!! That is it. It couldn't have been any easier... a monkey could have done it (sorry to my hubby). Instantly there was a difference while he tested it with the gaming applications. IT handled it effortlessly. The connection wasn't dropped as it would have been atleast twice a night beforehand. Then came the streaming of the HD content ( I AM SAM)... once again... it was quick and there wasn't any buffering like we had before when there was a lot of action in the scene. It works and it is a wonderful solution for hard-core gamers that can't handle the response that they receive from a sometimes sketchy wireless connection. If you NEED to be wired in many applications... not only one; and don't want to run a million wires all over your home; then this would be a sound investment. IT is a touch pricey, so that is why I say it should only be for a hard-core gamer. Also, most do rent and they do not have the luxury of having their wires running hidden throughout their walls; hence the ugly black cords spider-weaving in many renters apartments in NY. This would be the solution to end that. The downside... it is clunky and it takes up outlet space. Another pet peeve... you have to have outlets near the product you want it to "wire". Highly recommend... at a price drop. More reliable than wireless; 360 owners proceed with caution. I had been having a lot of issues with my wireless network dropping me from XBOX Live periodically. I did not want to resort to running a long Ethernet cable from my XBOX 360 to my router so I decided to try this product. For the most part, it seems to be very reliable and I always have a connection to XBL without being dropped a few minutes later for no reason. Set up was so easy I didn't expect it to work as well as it did. Basically all you have to do is connect one of your plugs directly to the router through the provided Ethernet cable, and then use the other plug anywhere in your home to have instant internet access in that room. There is even a CD included that allows you to add an encryption Key if you are worried that your neighbors could somehow get on your network through the power outlets; the manual does mention that this is possible, though the possibility is remote. The manual also mentions that it should work with just about any home, but much older homes with different wiring schemes may not be able to use this product. For me, it worked very well with my XBOX 360 Elite and I no longer had to deal with my unreliable wireless connection. However after about two weeks of use my XBOX Elite started freezing on all of my games occasionally giving me the specific RROD code that indicates overheating. I felt the back of the console and it did appear warmer than usual, indicating that the RROD of death indicating overheating could be very accurate. I hadn't had any issue with my Elite up until now, and after working backwards, I had the suspicion that the PowerLine adapter somehow caused my XBOX Elite to fail. As absurd as this sounds, I am thinking the fact that I had the XBOX 360 and the PowerLine plugged into the same wall socket caused an issue with my console (PowerLine in the upper plug and the 360 in the bottom one). I have heard many times that the XBOX 360 should NOT be plugged into a power strip and I am guessing that the PowerLine somehow was interfering with the power to the XBOX by merely being plugged in the same outlet. Yeah, I know this sounds ridiculous; but I don't know what else it could be. Even though it is pretty much a fact that XBOX 360 is overall a piece of junk in terms of reliability (I've had to return four in 18 months time), I hardly think it is a coincidence that I started having problems with my Elite console only two weeks after using this. I'm sure the PS3 and GameCube will have NO issues with using the PowerLine in the same socket as the console, but if you have an XBOX 360 like me, it might be a good idea to use completely separate wall outlets to be safe. 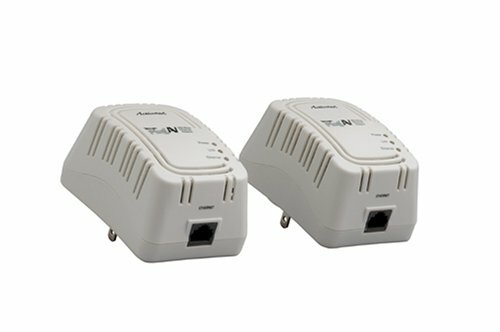 This Actiontec Powerline Adapter Kit provides a fast and reliable network connection for locations in your home where wireless is not fast and reliable, or for computers or game consoles that don't have a wireless adapter. It comes with two adapters and two 6' ethernet cables. It simply uses your household power wiring for an ethernet network, with ethernet connections able to plug in at any outlet. Plug your gateway/router into one power outlet and plug your ethernet-capable gaming console or computer into another outlet. It took me less than 3 minutes to get my XBox connected. No configuration necessary. At last, I was able to remove that 75' blue ethernet cable that ran down my hallway and across two rooms! If you have a wireless gateway/router, it still operates wirelessly (simultaneously with the powerline ethernet), so other wireless network devices in your home continue to operate as usual. Although I connected my non-wireless XBox to my router with this Actiontec device, I'd also like to have additional adapters to connect the computers in my home because my wireless signal is not always strong. I did test my normally-wireless laptop with this Actiontec adapter and it was easy to set up and start using. I simply plugged the ethernet cable from one of the outlet adapters into my laptop's ethernet connection, then went to my computer's Network Connections settings and disabled its wireless connection and enabled its ethernet (LAN) connection. These adapters encrypt your network transmissions based on a default encryption key built into the adapters. You can change that key using software provided on a CD in this product. There's no reason to do that unless you suspect someone will bring their own adapter into your home for the purpose of capturing and analyzing your network traffic. Actiontec is the maker of my wireless gateway/router that I got from Qwest with my DSL service, so they aren't an unknown company to me and they've been around for a few years. That routers been running for 5 years without a problem. Other than that, I can't speak for Actiontec's quality reputation. Naming this adapter kit a "Gaming" kit is deceptively limiting of its real usefulness. This product is equally valuable for providing a fast and reliable hard-wired network to your home computers. Internet responsiveness and speed is much improved on my computer that's located the farthest from my wireless router and where the wireless signal is weak. If your router or game/computer is farther than 6' away from an outlet, you can buy longer ethernet cables online or at a local electronics/computer store, or you can plug the Actiontec adapter into an extension cord. I didnt' try this, but see no reason why it wouldn't work. You can't plug the adapter into a power strip or surge protector, though. I'm surprised by the (high) price of this 2-adapter set. I didn't shop around, so I'm not sure how much other makes and models sell for. It seems like something that should sell for about a third of the current 3-figure price, but maybe there's more to it than it appears. If they cost less, I'd certainly buy another 2-adapter kit right away for my computers. Your house is already wired for Ethernet access and you didn't even know it. 2. The instructions say it MAY NOT WORK on a wall outlet or power strip that uses surge protection, but it worked for me when using a power strip with surge protection anyway. 3. If you buy extra adapters, they extend your network. There is still room for improvement, but not enough to recommend against buying the Actiontec MegaPlug in most circumstances where you're pretty certain of your network's security. 1. The device is a little too big to allow sharing of a common wall outlet. See the photo I've posted on the product page to see how much space it takes up. 2. Out of the box, it does not force you to assign an encryption key which could leave your Internet connection open to other people. For example, I'm in an apartment building. I'm not sure if my network connection is available to anyone in my building with a MegaPlug AV when the encryption key is unassigned. 3. Software to assign an encryption key is only available to Windows XP and Windows Vista, not Mac OSX or Linux. Using the software on Vista requires that you right-click in the software and select "Run as Administrator". That seems sloppy to me. I shopped around quite a bit before I put this item on my Christmas list. I wanted something that would allow me to extend our home network to our living room to hook up multiple gaming systems and a Slingbox Solo. Powerline networking has been around for a while but has usually been expensive and relatively cumbersome for the average person to setup or troubleshoot. In fact, ten years ago I went with home phoneline adapters instead of the power ones for the same reasons. I'm happy to report that these adapters work great. They work right out of the box, but I elected to change the security key. I installed the software on my laptop, plugged one unit in and configured it, then did the same with the second one...took about 10 minutes from start to finish. For my setup, I have one adapter in the living room plugged straight into the wall, with the ethernet cord connected to a switch. From there I have a Wii, XBox 360, and a Slingbox connected to my network. My Slingbox functions great both on my network and over the Internet; very few problems streaming video so far. Gaming is great, though I noticed a poor ping and some lag when using the 360 and Slingbox at the same time, but let's face it, those are two very bandwidth-hungry applications. All of my switches/routers/adapters are 10/100, so there's no way I'd hit the advertised 200Mbps under even the most optimal circumstances.